Police Chief Dave Erickson pins a badge on Myles. 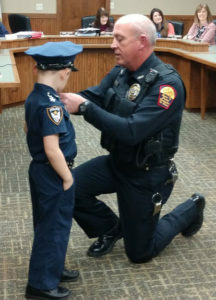 A swearing-in ceremony was held last night for a new police officer in the southwest Iowa town of Atlantic, though the new lawman is only six-and-a-half-years-old. Myles Jones has always wanted to be a cop and he’s already a top-notch fundraiser for the department. He was sworn in by Atlantic Mayor Dave Jones as Police Chief Dave Erickson knelt beside tiny Myles. 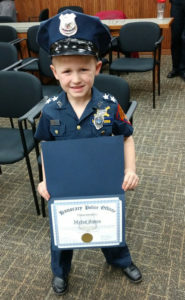 After taking the oath, the young Jones, in full uniform and police hat, was presented with a certificate, an official badge and the title of Honorary Police Officer for the City of Atlantic. Chief Erickson was beaming as he pinned the badge on the boy. “Good job, officer,” Erickson says. “Proud of you.” Myles was asked why he chose to pursue a career in law enforcement. “I want to be an officer because it’s really cool and it’s because I like the outfit,” he says. Also, he says, he likes to run after the bad guys. Myles is the son of Erick and Sara Beth Jones who live in nearby Massena. Myles raised more than $3,700 himself for the Atlantic Police Department’s children and families Christmas and other programs, stunning his mother. Last Sunday, Myles helped the department with its annual “Shop-with-a-Cop” program at the Atlantic Walmart. When asked why he raised the money, he said, “It’s just my duty.” His mom says the community response was unexpected and provided her son with a valuable lesson on helping others — which is what police officers do.